From “The History of Detroit and Michigan” by Detroit’s first cartographer, Silas Farmer. “This the larger portion of the territory on Fifth and Sixth Streets, for several blocks each side of Michigan Avenue, is called Corktown, because chiefly occupied by people from the Emerald Isle. The eastern part of the city, for several blocks on each side of Gratiot Avenue beyond Brush Street, for similar reasons is often spoken of as Dutchtown, or the German quarter. That part of the city lying a few blocks north of High Street and between Brush and Hastings, is known as Kentucky, from the number of colored people living there. A walk a few blocks east and north of this locality terminates in the heart of Polacktown, where many Poles reside. The portion of the city just west of Woodward Avenue and north of Grand River Avenue, forming part of the old Fifth Ward, is sometimes designated as Piety Hill; for the reason that it is largely occupied by well-to-do citizens, who are supposed to largely represent the moral and religious portion of the community. Peddler’s Point is the name frequently applied to a part of Grand River Avenue near Twelfth Street. The intersection of several streets at that place forms a pointed block, which locality is a favorite place itinerant hucksters to intercept and purchase supplies from farmers coming in on the Grand River Road. Swill Point is not the very euphonious appellation sometimes given to a portion of Larned Street near Second, because of a distillery formerly located near by. Atwater and Franklin Streets, for several blocks east of Brush Street, are frequently designated as the Potomac. This locality is near the river, and in memory of a familiar saying of the last war, the phrase “all quiet on the Potomac” indicates that otherwise disturbances might be looked for in the region indicated. 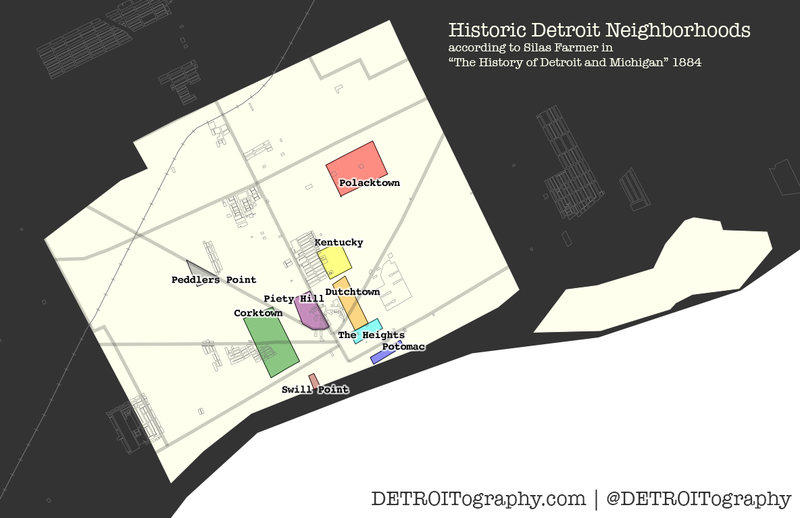 Many of these names remain with Corktown likely being the most recognizable. The development of the expressways changed the neighborhood, but did not wipe it out as it did to neighborhoods like Kentucky along Hastings Street which barely even exists today. Dutchtown isn’t much referred to today, but Germantown Park (Harmonie Park) can still be visited Downtown. Polacktown seems to have morphed into Poletown and the Polish population moving to occupying Hamtramck. This map also includes the local historic designations. Beyond the 1884 referenced boundary from Silas Farmer, there are only about 4 other major clusters of historic areas. Downtown was a critical zone for various immigrant communities to make their start in Detroit. Greektown is the well known name today, but a series of immigrant groups have cycled through that neighborhood throughout Detroit’s history.